The White-fronted Amazon or Spectacled Amazon Parrot (Amazona albifrons albifrons) is the most abundant of the Amazon Parrots. They are native to Southern Mexico and Central America (Guatemala, Honduras, Costa Rica and Nicaragua), where they frequent dry areas with trees, cactus and thornbush savannah, as well as rain forest areas from sea level to 1,850 m (6,200 ft). They are often seen visiting fruit plantations and cultivated areas. In the wild, they are not shy and people are often able to approach them. They are usually quiet and inconspicuous when feeding or resting in trees. Flocks may congregate and people have seen groups that number into the hundreds. The White-fronted Parrots are most often seen in small flocks of up to 20 birds. These groups may also contain flocks from other species such as the Red-lored Parrot (Amazona autumnalis) and the Yellow-lored Amazon (Amazona xantholora). 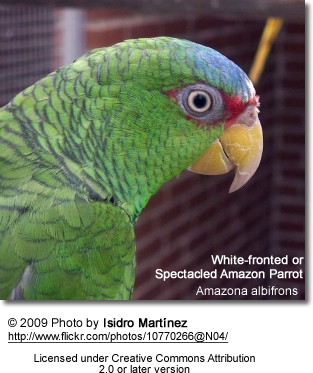 the Sonora White-fronted Amazon (Amazona albifrons subsp. saltuensis). Though the White-fronted Parrot is of average size, it is relatively small when compared to other Amazons at atypical length of only 9 - 10.4 inches (~25 cm). This species is named for the bright white patch of feathers which is seen on their foreheads, although the amount of white varies from individual to individual. 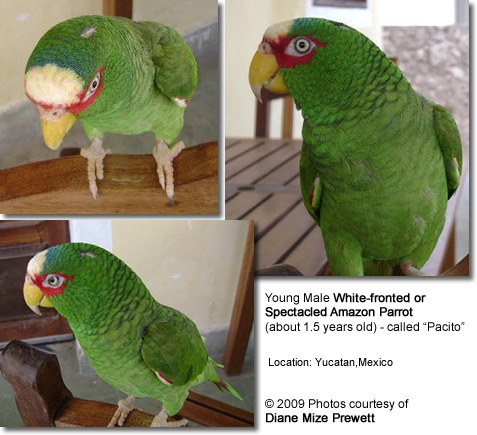 They have green plumage throughout, red coloring around their eyes (in some individuals almost like a mask) and blue coloring on their outspread wings and behind the patch of white on their foreheads. The beak is light yellow and their feet are light grey / brown-gray. 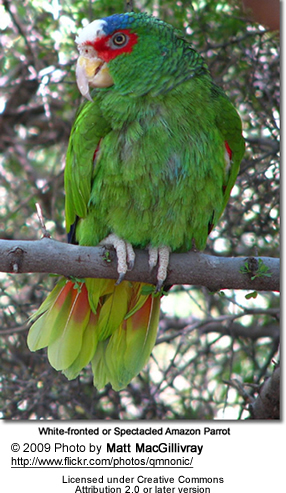 Unlike other amazon species, males and females can be distinguished by appearance; males have bright red feathers on their shoulders (alula), while females have green shoulders. Juveniles have pale grey irises and less red on their face and the white area is replaced with a smaller yellowish area. 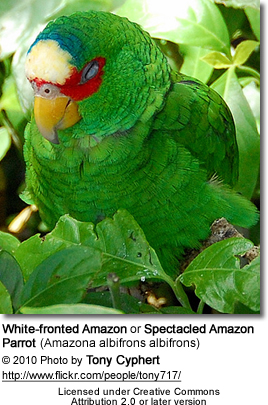 Similar Species: The white and blue patches on top of its head clearly differentiates the White-fronted Amazon from the Red-spectacled Amazon. The White-fronted Parrot has a potential life span of about 40 years. White-fronted Amazon Parrots are medium-noisy to noisy with shrill, raucous or barking calls. They can imitate a range from 30 to 40 different sounds. Natural Diet: They feed on a variety of fruits, particularly figs as well as berries. They also eat various seeds, nuts, leaf buds and flowers. They are also considered crop pests as they forage regularly in grain fields causing considerable damage to crops. Captive Diet: A good quality dry food mix should be available at all times that may includes sunflower, safflower, wheat, oats, canary grass seed and various millets. Sprouted seeds should also be available - especiallyspring and summer. Additionally, a fresh supply of fruits and vegetables should be provided daily, particularly figs, bananas, peaches and apples; as well as half-ripe maize, rose-hips and greenfood, such as chickweed and dandelion. They also need regular mineral supplements and soft foods when raising young. Like most other amazon parrots, the White-fronted Amazon can get noisy -- which should be a consideration for those who are intolerant to noise. Even though talking is not one of their strong points, some individual birds have developed impressive vocabularies. 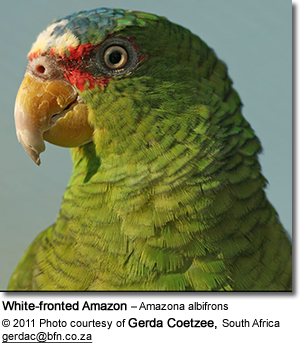 White-fronted Amazons are lively birds that need plenty of space to exercise. They are initially shy and reserved, but young birds will soon grow confiding. They are very hard chewers, and measures need to be taken to bird proof the area the pet is in to protect furnishings. A regular supply of fresh wood / branches are necessary to redirect their urge to chew. They are susceptible to intestinal infections during acclimatization period, but are hardy once acclimatized. They may get aggressive towards other species as well as their caretaker especially during the breeding season. Their life expectancy can exceed 50 years. Their breeding season is usually in the spring, starting in February and ending in the summer (in June and July in most areas). In their natural range, the breeding season usually starts in November. The White-fronted Amazon nests in tree cavities. After breeding, the female will lay an average of three to four eggs each measuring 30.3 x 22.7 mm (1.19 x 0.89 ins). Eggs are incubated for 24 to 26 days and chicks fledge at an age of 7 to 12 weeks. Breeding in captivity has rarely been achieved. It's best to isolate pairs during the breeding season, which usually commences in May if kept outdoors, earlier if housed in indoor flights. They get particularly noisy during the breeding season, and are often aggressive towards their caretaker during that time as they are protective of their nest. These lively parrots need a spacious flight (3 x 1 x 2 m or 9 x 3 x 6 ft) with an adjoining shelter to protect them from the elements (1.5 x 1 x 2 m or 5 x 3 x 6 ft). As they are heavy chewers, metal construction of the outside flight is recommended. A suitable nestbox would be of the following dimensions: 25 x 25 x 50 cm (10 x 10 x 20 ins) with entrance hole 6 cm (2 ins) wide.